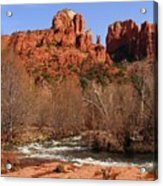 Red Rock Crossing Sedona Arizona by Marilyn Smith - 8.000" x 6.500"
Red Rock Crossing Sedona Arizona framed print by Marilyn Smith. Bring your print to life with hundreds of different frame and mat combinations. Our framed prints are assembled, packaged, and shipped by our expert framing staff and delivered "ready to hang" with pre-attached hanging wire, mounting hooks, and nails. 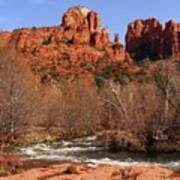 There are no comments for Red Rock Crossing Sedona Arizona. Click here to post the first comment. 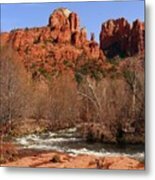 One of my favorite places in Arizona is the Sedona area, including the Red Rock State Park. It is one of the most photographed spots in Arizona. I didn't realize I had captured the little boy throwing rocks in my photo until I downloaded it later!